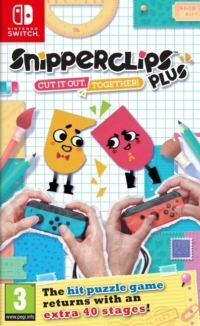 Snipperclips: Cut It Out, Together is an original puzzle game developed by SFB Games and published by Nintendo for their Nintendo Switch console. Snipperclips: Cut It Out, Together! for SWITCH is an original puzzle game developed by Nintendo for their newest console, Switch. Snipperclips: Cut It Out, Together! for SWITCH consists of a series of different logical puzzles. Even though they may not seem that complicated initially (popping balloons, erasing pencil marks), finishing some of the game’s levels requires not only creative thinking, but also good reflexes, and cooperation with other players. Playes take the roles of paper characters that can “cut” themselves into different shapes and sizes. By doing so, they can become hooks, pins, or special handles that can be used to move specific items. The riddles were divided into two groups: for the beginners, and for the advanced players. Snipperclips: Cut It Out, Together was designed as a coop game for up to four players, but offers some competitive game modes as well. Snipperclips: Cut It Out, Together for SWITCH has colourful, 2D visuals. The game’s physics engine is also noteworthy. It flawlessly takes care of the collision detection, interaction between the characters and the game’s environment. Snipperclips also uses the “Share the Joy” option. Each of the players uses one of the detachable Joy-cons. Game score 8.55 / 10 calculated out of 42 players' votes. Expectations before the premiere: 9.0 / 10 calculated out of 1 players' votes.